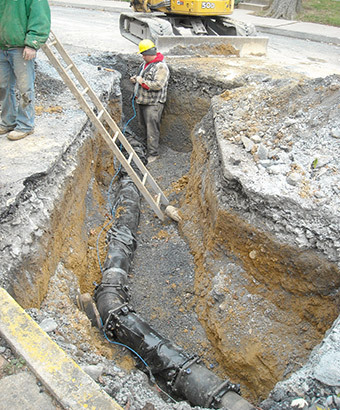 Hanover Engineering was retained by Myerstown Water Authority to provide design and construction administration services for the replacement of a portion of the Authority’s water main system located along Washington Street in Myerstown, Lebanon County. The project included the installation of approximately 2,300 linear feet of 8-inch ductile iron water main wrapped with polyethylene film for corrosion protection, 50 linear feet of 4-inch waterline with 6-inch gate valves, 1-inch HDPE service laterals, and fire hydrants. The design and construction of the project needed to be fast-tracked to ensure the Authority’s water main replacement work was completed prior to the Borough starting their planned road reconstruction project. Hanover Engineering prepared the plans, specifications, and contract documents for the project, as well as assisted the Authority with the bidding and award of the contract. Hanover Engineering also assisted with construction administration throughout the project, and provided a full-range of construction management and observation services, including reviewing shop drawing submittals, approving field changes and processing change orders, and reviewing payment application requests.